What: For over 35 years, Garfield phones have been washing ashore in Brittany, France. For all that time, locals have been baffled by the periodic appearance of the seemingly endless supply of these phones – nearly 200 were discovered in 2018 alone! Well, the mystery of the Garfield phones has finally been solved! After a tip-off from a farmer, a team of environmental researchers and journalists discovered a long lost shipping container believed to have carried the phones within a cavern. Pieces of a few remaining Garfield phones were found strewn out around the container and cave. These have now been cleared up, but all too many have been taken out to sea. 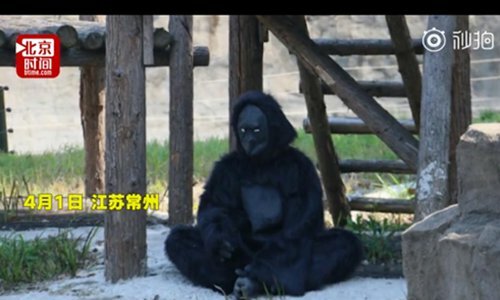 What: Visitors to an East China zoo were not impressed when they showed up on April Fool’s Day and discovered that the zoo’s orangutan and black bear had been replaced with employees in costume. People were even more upset to find that the orangutan was locked up behind a fence, and jumping up and down as it expressed its displeasure. The zoo has defended the gag as they say it amused visitors. As far as we can tell, no one was very amused. What: AirBnB loves its quirky stays and contests. Do you remember when they turned a shark tank into a bedroom? Well, this time they’re turning the Louvre into your personal living space. For example, the “house’s” living room will be directly in front of the Mona Lisa, and the bedroom will be inside the museum’s central glass pyramids. So, if you loved Ben Stiller’s Night at the Museum, this is your chance! You can apply for the chance to stay in the Louvre here. What: For the second year in a row, Finland has been named the happiest country in the world, narrowly beating out Denmark and its other Nordic rivals. In honour of its win, Finland has developed a “Rent a Finn” initiative, where it attempts to show the rest of us how to be happy. In this initiative, eight ordinary Finns have signed up to act as “happiness guides”. These Finns will share their homes and lives with a few lucky travellers. Visits will take place in Summer 2019 and will be free of charge to the winning travellers. If you need a Finn to teach you happiness, you can apply at Rent a Finn’s website. Read also: How to get hygge with it in Copenhagen.